Pelican Cay and the vivid ocean at Bambarra Beach, Middle Caicos. Bambarra Beach is one of the calmer and nicer beaches on Middle Caicos. The island out in the water is further out than it looks! Bambarra Beach offers shallow ocean water, is typically quite calm as well. Learn more about the beautiful coasts of Middle Caicos at Beaches of Middle Caicos. 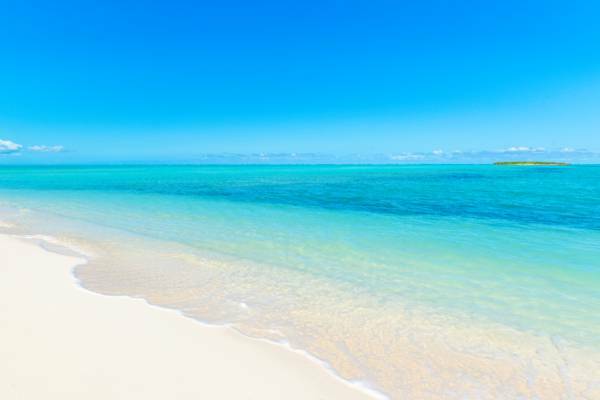 Bambarra Beach is a beautiful and long coast that found on the central north coast of Middle Caicos. This beach is on an extensive and shallow bay, so the water here is calm, clear, and a little warmer than surrounding coasts. This beach fronts the small historical settlement of Bambarra, which has stood since the days of the Loyalist plantations in the late 1700s. Bambarra Beach is a great and calm coast for swimming or relaxing at. It make a great stop after visiting the majestic Mudjin Harbour, where the surf and swell can be far more powerful. Consequently, Bambarra Beach is a great place to visit with small children due to the tranquil ocean conditions. A small pier for local fishing boats is found here, along with several small tiki-huts. Casuarina trees line the coastline, and provide excellent and dense shade. There’s no decent snorkelling near Bambarra Beach. See North and Middle Caicos Snorkelling for location and reef information. Fishing boats at Bambarra Beach, Middle Caicos. The exquisite and uninhabited rock of Pelican Cay is found in the bay fronting Bambarra. Like many of the little cays and rocks on the northern coasts of the Caicos Islands, this island is primarily marine limestone, with limited amounts of salt-resistant coastal vegetation on top. Visitors to Bambarra Beach may feel tempted to walk out through the shallow water to Pelican Cay, but be aware that it’s almost half a mile (.8 km) off the coast. It’s definitely possible to wade out, yet it’ll likely take longer than expected. Every year in February, the colourful Valentine’s Day Cup model sailboat race takes place on Bambarra Beach. 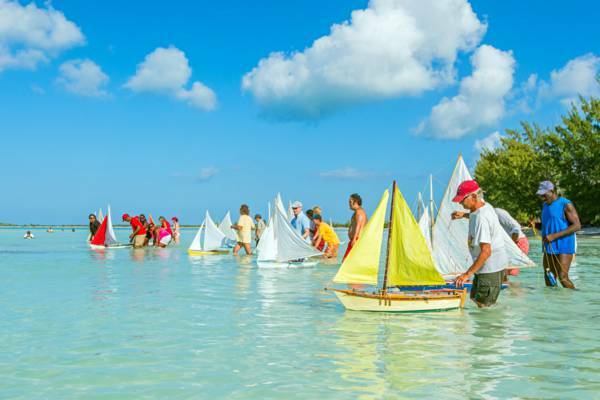 This cultural celebration features model Caicos Sloop races, beach BBQs, and live music. As is sometimes the case throughout North Caicos and Middle Caicos, mosquitoes and no see ums (biting midges) can be present at times. Consider bringing insect repellent. The annual Valentine's Day Cup model sailboat race held at Bambarra Beach. Navigation across North Caicos and Middle Caicos is simple, as the road layout across the two islands is quite linear. 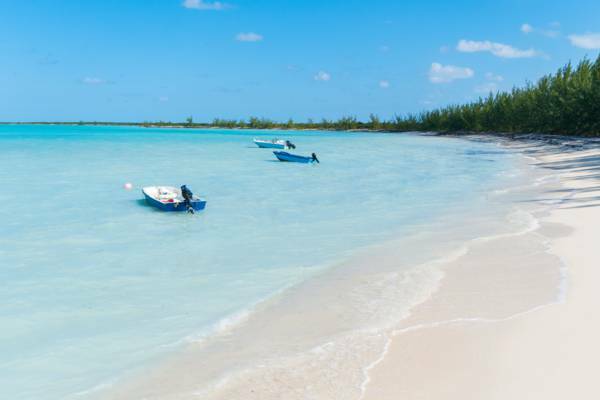 From the passenger ferry port at Sandy Point, simply travel on the main paved road across North Caicos, cross the causeway, and continue on the main paved road that leads through Middle Caicos. If you stay on this main road, you pass the entrance to Dragon Cay Resort and Mudjin Harbour, and Indian Cave. Take the first paved left at the small power substation, which is before the Middle Caicos Airport and Conch Bar Caves. You’ll be in the village of Conch Bar at time point. Take the first paved right, which is the start of a extensive paved road that leads to Bambarra and Lorimers. The only tricky part in getting to Bambarra Beach is finding the final beach access road. You’ll want to stay on the road from Conch Bar for 5.5 miles (8.8km), and the access is on the left. Look for an unpaved road with a few small coconut palms. If the road makes an abrupt right at a cut in the soft limestone hill, you’ve just passed the turn. Once on the beach access road, continue for .75 miles (1.2km) to the ocean. Check the map below. The parking area with the tiki huts at Bambarra Landing is the main access to this beach. The main access for Bambarra Beach. A 4000 foot (1200 meter) sandy road leads from the paved road to the beach. Tiki-huts and a small pier can be found in this area. Last reviewed by an editor on 9 November 2018.